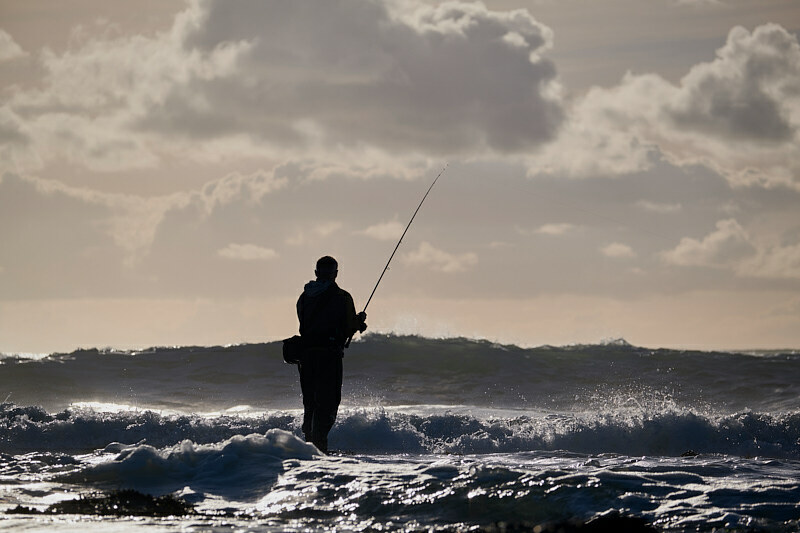 We took a bit of a punt yesterday afternoon on some surf fishing, and whilst we came away from a session that in theory was hardly electric, for me it was about as good as I could have hoped for. I am as obsessed about photographing fishing as I am about actually fishing, and as much as I need to shoot certain images for work reasons, when you give me the conditions and light and a mass of tumbling, sparkling water such as we had yesterday, well the fact that only two bass were caught for me means little when compared to how much I loved the photography side of that session………..
As a photographer and an angler, I just love moving water. I have photographed loads of fly fishing features on lakes for example, but give me a river or the sea and creatively I am always happier. Water that moves either via flow or tides or current or like yesterday via a stunning bit of swell seriously does it for me, and of course if we get light like we had up on the north coast as the sun dropped away plus I’ve got a few good anglers to shoot who also happen to be winding up their new APIA Grandage rods with some long-casting metals, well that’s me done really. For sure I was there to fish, but in reality I couldn’t not strap my own lure rod to my side (fast flooding tide, nowhere to put rod or rucksack down) and fire away with my camera gear. Just moving around where the anglers were standing gave me a bunch of different lighting options, and like a pig in the proverbial I fired away! Not only do I clean my fishing gear down when I get home from a surf session like that, but then I need to dump all the photos, have a quick scan through them, back them up, and then start the editing, keywording, and outputting process. What are early mornings for if you’re not out fishing?! Mark and I have never deliberately targeted “proper” surf conditions where we were yesterday afternoon, so when our mate Andy nailed a couple of bass within about half an hour of being there, well that was my day made on the fishing front - and that was before I started to hyperventilate because the light was going off so well with the surf conditions and where the guys were standing to fish etc. As much as I’d love to have smashed a heap of bass, the punt paid off with those two fish, and then I can’t help but weigh up in my head how a load of bass could actually have impacted on my photography and so on. Believe me, my head works in mysterious ways! Mark was using his new Apia Grandage 100M 10' 12-42g rod and Andy was out for the first time with his brand new Apia Grandage 106MH 10'6'' 14-50g rod. I have briefly cast them both and I’d happily take either - holy cow they are some rods, they don’t remotely feel their length, and to me they are a big step up from the previous generation and now discontinued APIA Foojin’R Grand Swell 96MH 9’6’’ 7-42g that I have fished with so much. These new APIA Grandage rods are far easier to work with, indeed I have already reviewed and seriously loved the Apia Grandage 96ML 9’6’’ 7-28g - see here. These new Grandage rods feel a lot more versatile, you can get at the power without having to work too hard, I’d fancy them for all kinds of lures, and when you go for it with say a 40g metal on these longer, more powerful rods, it’s about as sweet a casting and fishing experience as I can imagine. I know the Art of Fishing who do APIA rods here in the UK got a bit of a shock when they sold these new rods out almost the moment they got them in, so if you fancy one then give them a shout and put your name down for the next batch coming in - behind me of course! We had some stunning surf (and light) conditions yesterday afternoon, but we didn’t have any hectic onshore winds, so it was interesting how Andy was very able to work some metals/jigs, instead of having to simply crank them in because the wind dictates it. He caught both his bass on metals that he was (shore) jigging at range - and both fish hit him on the drop. I believe me that his bass came on a Daiwa Shore Rifle Casting Jig that he (the tart) picked up over in France the other day. I have owned and used a fair few casting jigs over the years now, but I do like how Andy’s one had a larger profile than the much smaller ones I have tended to play around with. Anyway, there you go. Nothing hectic on the fishing front, but from my photography point of view I hope you get a sense of just why those few hours floated my boat so much - and let’s be honest, I can’t see how any lure angler out there couldn’t get buzzed up from punching lures out into a stunning bit of surf.